New book reviews added July 2012 and another set in November 2013. I was sent another superb parcel from KidsIQBooks and these are reviewed below. Do take a look at their website - they have some wonderful collections of books and all great value. From their website: "We are an on-line retail company selling a large range of children’s educational and story books at discounted prices, aimed at babies through to children sitting their A Levels. We understand the importance of parents and children working together in learning. We aim to help you with your child's learning and development by displaying a wide variety of educational books which support the UK Curriculum and are also perfect for all your child’s reading needs and general knowledge enhancement. We also try to provide additional information regarding the education system and point you in the direction of other sources of information. Your encouragement and support as a parent along with great resources is certainly a recipe for much fun and fulfilment. So help your child’s development and confidence through reading, but most of all have fun learning together." I was sent a super collection of books from KidsIQ Books. They arrived next day and were securely packed so were all in perfect condition. Minecraft is an open world game that has no specific goals for the player to accomplish, allowing players a large amount of freedom in choosing how to play the game. The game world is essentially composed of rough 3D objects that are arranged in a fixed grid pattern . Players can move freely across the world but objects and items can only be placed at fixed locations relative to the grid. Players can gather these material blocks and place them elsewhere, thus allowing for various constructions. The Minecraft Beginner’s Handbook is ideal for those starting out into this addictive world with expert tips on creating a home, finding resources, and making armour and weapons to protect yourself from the terrifying creatures that come out at night. The Annual introduces the game and includes builds, papercraft and puzzles and games - it's a great companion for all fans of the game and takes knowledge to a new level. The books include exclusive tips from game creator Notch, and first-hand accounts from well-known Minecraft experts that will give you the knowledge you need to survive and make it to the next level. An excellent value set of six books which covers the key learning topics for children age 4 to 5 - Simple Sums, Count to 20, I Can Write, I Can Read Words, Fun with Phonics and Learn the Time. The books are packed with colourful activities and the helpful notes for parents assist in teaching and gaining maximum benefil from the books. There are gold reward stickers for an added incentive. Other good value series include I Can Learn Age 3-4 Collection, I Can Learn Age 5-6 Collection, I Can Learn Age 6-7 Collection and many more. I was sent the first 3 books from the collection of 8 shown alongside. That was plenty to give me a feel for the excitement of these books about young Charlie Bone, descendant of The Red King. He is the reluctant owner of a special gift - he can hear voices in photographs. THis gift means he is sent to a special school called Bloor's Academy. His quest is to unearth the dark secrets in his mysterious family, the Yewbeams. The series will appeal to fans of Harry Potter but it is far from being a copy. It's a great series in its own right. I love the idea of giving children the whole set, so they can read straight through the series and have a set to treasure. This is another series of eight books, again giving children an excellent opportunity to follow the characters and see how the story develops. The series is set in a fictional Viking world and stars Hiccup Horrendous Haddock III who owns a hunting dragon called Toothless, and has a best friend called Fishlegs- as you can guess from the names of the characters, it is a hilarious series. He is an unusual for a Viking because he thinks before he does anything, and he is able to speak Dragonese, the language of the dragons. Plenty of jokes to keep kids laughing throughout the books, and lots of hilarious drawings and varied use of fonts to keep interest alive. A superb historical fiction series, which brings to life the late 18th century, with vividly depicted settings in London and Paris and each written somewhat like a play - for the star, orphan Cat Royal started life at Drury Lane Theatre. The main themes are slavery and equality between people from all races and social classesThere are six books in the series and together they make a really satisfying read and help the reader to understand the period. All the series of books from KidsIQBooks represent excellent value. They are ideal for school libraries and classrooms, as well as to build up children's personal libraries. The Mystery of the ... Burnt Cottage; Disappearing Cat; Secret Room; Spiteful Letters; Missing Necklace and Hidden House - I remember them well and loved them! This set contains the first 6 of the series of 15. The five Find-outers (and don't forget the dog, Buster) solve mysteries that even the police have given up on - although perhaps PC Goon is not the brightest star in the police force! It seems that every school holiday throws up a new mystery in the village of Peterswood and the five are always on the spot. The first book sets the scene and introduces the characters, all of whom are typical of Enid Blyton. Plenty of adventure and puzzles to enjoy. This is one of Enid Blyton's most popular series - although she has often been criticised, children still love her books and that is the most important thing. The Mr Gum books by Andy Stanton are hugely popular so it's great to see this good value set available. Mr Gum is just the most miserable man you could imagine and everybody keeps away from him as much as possible. This set contains the first three stories - You're a Bad Man, Mr. Gum! ; Mr. Gum and the Biscuit Billionaire and Mr. Gum and the Goblins. The books are hilarious and really appeal to a child's sense of humour. They also gain a huge sense of satisfaction from reading them, as there are around 10 lines to the page as well as plenty of illustrations,meaning a child can read a whole thick book quite easily. They also make lovely bedtime stories to share as adults will find them just as much fun as children do. There's a little surprise at the end of each book too! Andy Stanton is a deserving winner of the Roald Dahl Funny Prize. Michael Morpurgo is one of the very best children's authors writing today and this collection is an excellent showcase of his work. It contains Friend or Foe; Twist of Gold; Waiting for Anya and Little Foxes. His work is always thought provoking and Little Foxes is about a boy who was bullied and a fox he tries to save. Waiting for Anya has as its theme the plight of Jews under the Nazis and Friend or Foe is also set in World War II as David battkes with shared loyalties. Can Sean and Annie save their family as they journey to America away form the Irish Potato Famine? As well as being a good collection to have at home, this would be an excellent resource fornursery and reception classes. It is a series of cautionary tales to help children learn to distinguish right and wrong behaviour. The titles speak for themselves - Say Please, Louise! ; Don't Tell Tales, Lucy! ; Give That Back, Jack! ; Don't Be A Bully, Billy! and Don't Be Greedy, Graham! Simple, repetitive text with each page illustrated in full colour and gently padded covers make these books really attractive. Children will absorb the gentle messages without feeling preached at and enjoy the story at the same time. Here are some more excellent value collections I would recommend. This is a lovely set of 6 little board books, attractively presented in a slipcase - and you can put the books together to make a jigsaw! Tractor, motorbike, police car, train, lorry and fire engine to enjoy with your little one. Plenty of vehicle noises to make reading aloud great fun. And the perfect size for little hands! This is a brand new series of Mr Men books and they are every bit as good as the originals, but with attractive glittery covers. Meet up with old favourites, including Mr Tickle and Mr Bump, in these new stories guaranteed to get a whole new generation enjoying the fun. You might also be interested in Mr Men My Complete Collection and the Little Miss Glitter Collection. All are lovely as complete sets but also, individually, make ideal gifts. The set contains six new stories. My favourite is Mr Nosy and the Beanstalk. Just how much trouble can one naughty little girl cause? Quite a lot, it seems and you will have great fun finding out just what mischief she gets into. My children were great fans of these books and I can remember many happy bedtime reading sessions with these lovely gently humorous stories. It is great to see them made available to today's young readers. Shirley Hughes' beautifully detailed illustrations perfectly complement the stories and offer plenty of scope for discussing the stories. Three books in this set - My Naughty Little Sister; My Naughty Little Sister's Friends and My Naughty Little Sister and Bad Harry. Jill Tomlinson's books have always been huge favourites with children, with her heartwarming animal stories. She really brings the characters to life and children can readily identify with the themes of the stories - children want to find out, can be afraid of the dark, and want to be safe in their own homes, just as the animals do. These are very reassuring stories, both for reading aloud and for young independent readers. The four books in this lovely set will have great appeal to children. Once your children have enjoyed these, try More favourite Animal Tales. The 3D cover of this book instantly appealed, which is a great start. Six topics are comprehensively covered in this excellent book - Explorers, Mummies, Vikings, Ancient Rome, Arms & Armour, Gladiators and Knights & Castles. Ideal to support KS2 history, this has all children will need to know, and more. The double page spreads contain just enough information on each topic and the book is ideal to support project work. Copiously illustrated and crammed full of fascinating information, I think this book will be of particular interest to boys as it covers many of their favourite historical topics. A fantastically good value book. 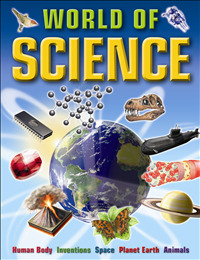 This comprehensive volume divides science into key areas - space, planet earth, weather, oceans, insects & spiders, reptiles & amphibians, birds, mammals, general science, human body and inventions. There is so much content that each would make a great book by itself. Each topic is covered in a double page spread, copiously illustrated (and well labelled diagrams), and with an ideal amount of text to answer those homework questions. There are plenty of activities and quizzes (plus answers) too, which give practical experience and ensure understanding.